Treat yourself to a full set of lash extensions or if you have extensions come into Bloom for a refill. Warning: Be ready to be full on addicted! The Bloom wax is one of our favorite services. Whether you are looking for a new brow arch or just a clean up we're here to help. You will leave looking pretty & polished. Beautiful skin is always in! 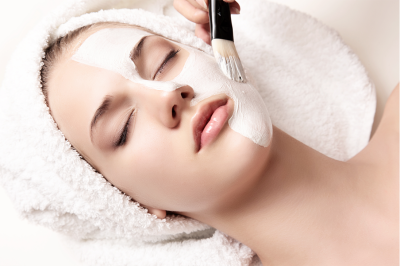 Refresh & hydrate your skin with a soothing and relaxing treatment. Pamper yourself pretty. The Bloom makeup application is a perfect way to primp or change your look. We offer airbrush makeup for all day coverage. Or come in for an expert makeup lesson! Bloom is home to our very own makeup line, Bloom Bombshell. All Bloom Bombshell makeup is made for photography, great for brides and your very own selfies! Bloom's Keratin Lash Lift is a great alternative to eyelash extensions or for clients with sensitivities. It is a low maintenance lash solution for clients as results lasts up to 12 weeks. Using your own lashes, it is permed against a silicon pad to give it a natural looking "lift". These are perfect for those who have straight or downward facing natural lashes, giving your eyes and face an instant lift! You will look more awake and even more youthful! Add a tint to go with the lash lift service to make it really pop!